An artist’s impression of the West Basin waterfront once completed. Image: Supplied. 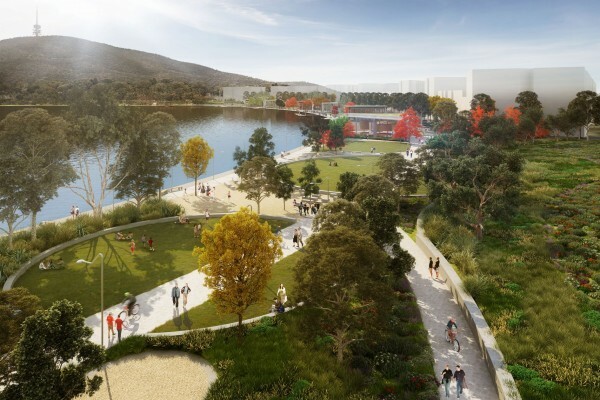 Testing of the lake bed at West Basin will begin next week as part of preliminary work to realign the shoreline for Stage 2 of the waterfront development, a key step in connecting the city centre to Lake Burley Griffin. The City Renewal Authority said the National Capital Authority had approved geotechnical investigations to determine the depth of the sediment on the lake bed, which will assist with the foundation design required to construct the proposed 500 metres of boardwalk and new lake wall. It said Stage 2, which is due to begin in early 2019, would also reclaim 2.8 hectares of the lake bed to provide for a generous waterfront urban park. The testing, which did not require drilling and would not disturb the lake bed, would take place from a barge in the lake over the next few weeks. The results will be used in the design plans to be included in the works approval application to the NCA for Stage 2, which will realign the West Basin shoreline so it is consistent with the National Capital Plan. City Renewal Authority chief executive Malcolm Snow said this would be lodged once negotiations with the Federal Government on the transfer of part of the lake bed to the ACT Government had been resolved. “The redevelopment of West Basin into a more people-friendly area is a key objective for the City Renewal Authority,” Mr Snow said. “That’s why our priority is the creation of high-quality public spaces as the first stage of redevelopment. West Basin is Designated Land and works approval from the NCA is required for all development work, with all applications subject to public consultation. I just hope they can work out a way to bury Parkes in an economic fashion. The success of the whole project depends on walkable links with the city. If the freeway traffic sewer stays as it is then the whole area will just become a lifeless and expensive enclave. Hmmm. I don’t agree that Henry Rolland Park is good. They’ve laid a pile of concrete and stuck exercise equipment on there which no one will hardly use. I’m sick of these development proposals that turn nice grassed areas with trees to another pile of pavings and concrete with crappy decorations that just look tacky. Henry Rolland Park looks awful, probably cost twice as much as it should and now we have to pay for it to be maintained. The only people who benefit are the companies winning these contracts. I have to disagree. I think it looks quite nice. Considering most of the area to be redeveloped is open carpark, I think there’s a lot to be gained. It’s interesting that the generalised monolithic white blocks used to symbolise the eventual apartments, are pretty much what the eventual constructions will probably end up looking like.